Red, white, and blue vegan oatmeal recipe, perfect for the 4th of July or patriotic holidays. 1. Cook Steel Cut Oats and spoon into a bowl. 2. Top with raspberries on one side. 3. Cover with blueberries on the other side. 4. Add a row of thinly sliced banana down the middle. 5. 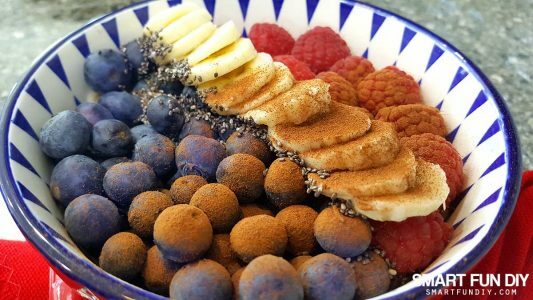 Sprinkle with cinnamon and chia seeds. 6. Add a splash of almond milk.